Simple is best. In life I waver on that: sometimes I pile things on, speed up and go for the gusto. But then there are other times when I take my time and go slow and breathe a little deeper. This salad is a perfect example of the latter. It takes that gloopy potato salad and reigns it in to the barest essentials. 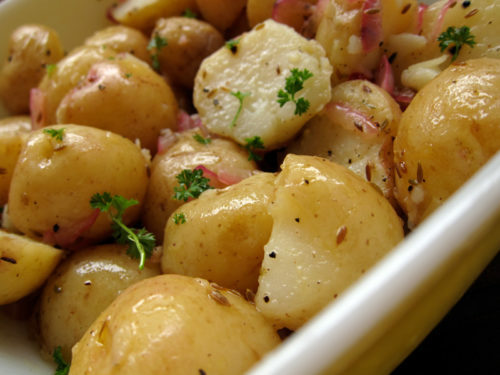 Brand new potatoes, creamy and mild, are flavoured with olive oil, red onion, lemon juice and cumin. And a hammering* of flakey salt and pepper, of course. Oh, and there’s parsley from my balcony garden for colour. It’s simplicity and it’s a joy, pure and simple. After my first bite you could see my smile. I was giddy. This potato salad made me laugh out loud. It seems silly, but it’s the truth. I was taken aback at how wonderful it was and how the brightness of the lemon and the earthy cumin mingled and sank into the creamy potatoes. I ate this salad barely warm with a piece of salmon for dinner. Later that night, I opened the fridge and snuck an icy potato from it’s hiding place, dusting it lightly with flakey salt before gobbling it up and licking my fingers. It was one of those Nigella tv moments where time stood still, just me and the potato and the white glow from the fridge. The next day, we ate the remnants for lunch and it was cold and refreshing and just as good and maybe just a smidge better. Me and this potato salad? We’re going to be best friends. Scrub and rinse potatoes, cutting any large ones in half or quarters. Boil in salted water until tender, about 20 minutes. Drain. Meanwhile, in a small saucepan, heat olive oil until hot. Add in cumin seeds and red onion over medium-high heat until fragrant, about 5 minutes. Pour oil mixture over drained potatoes, add lemon juice, sprinkle with a good amount of freshly ground pepper and kosher salt, throw in the parsley, and toss gently to coat. Serve warm or cold. * Tracy from Amuse-Bouche for Two left me a comment once about hammering her penne carbonara with pepper. Hammering! I loved that term, I’m using it here and I’ll probably use it in real life too. mmmmmmmmmmmmmmm now i know what to do with the little basket of new potatoes bought from the market. i love the combination of lemon and cumin! That’s funny; I just bought some new red potatoes and some dill with a simple, warm potato salad in mind. Potato salad is like pizza for me – even when it’s really bad, it’s still really good. And salmon – well, you just found me my main course. Thanks! I would have never thought of cumin in this capacity…lemon-y potatoes are always so awesome! If this potato salad made you go back to it for a midnight snack. Especially if it replaced something wonderful like ice cream or muffins. Well hot damn it must be amazing. Sounds good to me! What a lovely post! A joy to read. Potato salad is one of my favourite summer foods; I can’t seem to stop making different variations every week. I love the simplicity factor of this recipe. I’ll be trying it for sure! 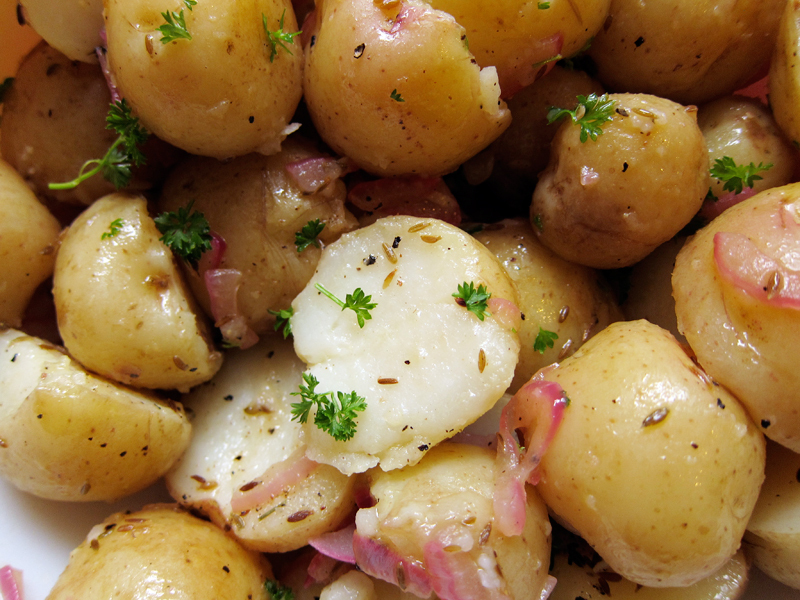 Mmmmmm…lemon and pepper are great together…and i love potatoes despite its high carbs! This is exactly how I like my potato salad, yum! Daily Spud, trust me on this one: bffs forever. Karen, I hope you love these spuds. So good. I agree, I love potato salads, Margie. PCWG, the cumin here really shines. It adds a wonderful earthiness. Yay, Naomi, you’ll love this one. Now I want to try one with cashews! It is amazing, I’m not exaggerating one bit, Joanne. Thanks Monika! It is simple, but it’s oh so good too. Thanks Jacqui, I’m sure you’ll love this version. 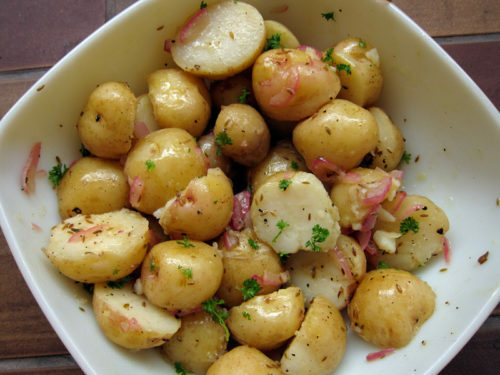 Mmm I love the sound of this simple potato salad! Those baby potatoes are hard to resist. I so often think simple is best when it comes to potatoes. I even eat my baked ones naked with just a “hammering” of salt because I really like the flavor of the actual potato. Your salad looks just about perfect to me. Oh, this looks delish! I love vinaigrette-based potato salads. Something makes me want to try adding a few blanched green beans to this one! Oh yum! What a great combination of flavors! I am a huge fan of cumin!!! Wow, that looks good, I am always looking for a version of potato salad…can’t wait to try this one…and its easy too! I love potato salad, and this one is making me swoon. I must try this version. The cumin seeds is an interesting addition to the standard. ps. lovely blog you have here! Love the pairing of the smoky cumin with the tang of the citrus. Just made a bean salad with similar flavours so I know that this is for me! I also generally prefer to go with simple recipes, but every now and then pull out all the stops. And I’m always looking for recipes like this one – simple combinations that you hadn’t thought of, but that in retrospect seem obvious. Okay, I have to try this one!!! I’m so excited!! I always make mine with green beans, horseradish, onions, oregano, lemon, dijon mustard, olive oil, s&p. Simple is the best. But flavour explosion is not bad, at all! I totally understand the love of a potato salad devoid of mayo. It is a joyful revelation! Can’t wait to try your recipe, looks like a summer staple. I love that you hammered 🙂 and you had your very own Nigella tv moment. I could just see it. Ashley, this salad was simple and wonderful. I loved it. Dana, I think so too! Thanks. Newlywed, green beans would be so good here! try it! Thanks Sarena, I’m a cumin fan too. Love the seeds especially. Hag, I’m sure you’ll love this. Wizzy, oooh, I’ll have to take a peek at your bean salad! Kaye, I love that you use horseradish! Sounds delightful. Yeah, forgo the mayo, Jule. It’s always better. Well, thank you for expanding my vocabulary, Tracy! this sounds right up my alley but nobody in my house cares for parsley–suggested substitutes? (please don’t say cilantro). chives maybe? marjoram? Love the recipe, nice and simple. And I love cumin and lemons. Jen, chives would be great here…actually any green herb. Mint? Basil? I’m sure marjoram would be great. Thanks Jason. It’s a good one! Okay, made this for supper, I think next time I will leave out the lemon juice, gave it a bit of a sourey vinegary taste that wasnt too pleasant. But otherwise LOVED it, here is the crazy thing, put the SAME ingredients on the cornish hen I made, and it came out great! may have put too much lemon juice on the potatoes. So definitely something to be made again! I’ve never used cumin seeds…is regular ground cumin out of the question? Katie, the cumin seeds add a bit of texture that you’d miss if you used ground cumin. I’ve never tried this with the ground spice, but I’m sure it will be good regardless. I’ve just made this for our Memorial Day cookout tonight and I sneaked a taste–soooo good! I am not a fan of regular potato salad with mayo, so this is wonderful to have in my file. Thank you! (Oh, and I had green onions and ground cumin and used those instead of the red onion and cumin seed–no regrets! I just ended up using less of the ground cumin so it wouldn’t overwhelm the other flavors). I have made warm new potato salad with crushed garlic, grated cheddar cheese, butter and watercress. Haven’t had a potato salad in ages……must remedy. I meant to say in my previous post that I have used toasted cumin seeds in a Jamie Oliver chicken and cucumber salad. I was immediately hooked. The salad also involved lemon juice and yogurt.